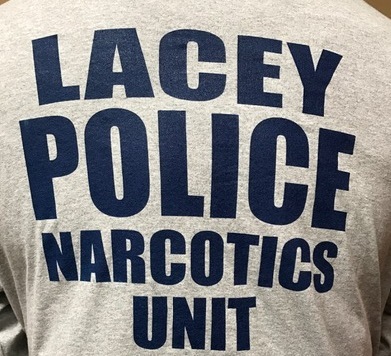 The Lacey Township Police Department Detective Bureau, in cooperation with the Ocean County Prosecutor’s Office Narcotics Strike Force, conducted a several month-long investigation into the distribution and possession of narcotics within Lacey Township. On Friday, April 12, 2019, detectives from the Lacey Township Police Department and Ocean County Prosecutor’s Office Narcotics Strike Force, assisted by the Ocean County Regional SWAT Team, and Stafford Township Police Department K-9 Unit, executed a search warrant at an apartment located in Building 7 of the Cornerstone at Lacey complex, 900 Gary Smith Way, Forked River. Present in the apartment at the time the warrant was executed were the targets of the investigation, Anthony Caruso and Kelly Trangone, both of Forked River, along with Robert Charlie of Bayville, Davina Deusinger of Browns Mills, and Jamin Alegre of Waretown. Located within the residence were large quantities of crystal methamphetamine, and several types of prescription medications including, but not limited to Oxycodone and Clonazepam. In addition, there were numerous hypodermic syringes, glass smoking pipes and straws containing residue, and drug paraphernalia consistent with the packaging and distribution of narcotics, including digital scales, cutting agents, baggies, and ledgers. All persons present were charged with Possession of Crystal Methamphetamine. Anthony Caruso was charged with an additional count of Possession of Crystal Methamphetamine, as well as Possession with the Intent to Distribute less than one half ounce of Crystal Methamphetamine, two counts of Distribution of less than one half ounce of Crystal Methamphetamine, and Possession of Drug Paraphernalia. Kelly Trangone was also charged with Conspiracy to Possess with the Intent to Distribute less than one half ounce of Crystal Methamphetamine, and Possession with the Intent to Distribute less than one half ounce of Crystal Methamphetamine. Davina Deusinger was also charged with Possession with the Intent to Distribute less than one half ounce of Crystal Methamphetamine, and Possession of Drug Paraphernalia.